We all expected a simple happy story when we arrived in Larabanga to meet Faruk and his family. However, we witnessed the social and financial impact that cleft lip and palate has on families in developing nations all over the world. Faruk’s father rejected him and his mother shortly after his birth. 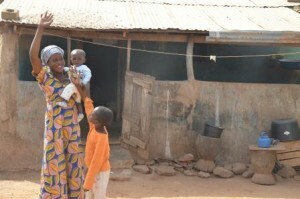 The father, his family and many members of the Larabanga community labeled Faruk and his mother as cursed. Although the community gradually started to accept Faruk and his mother after the repair, they still were living off alms. And then we heard Cynthia’s story. Cynthia is Faruk’s older sister, and she was living with her father’s family in Damango. However, her father disowned her after she brought water to Faruk and their mother when he was getting his surgery in July of 2013. Her voice broke and she fought back tears as she recounted her story and spoke about her determination to take care of her mother and brother if she had the money to finish school. Our hearts ached as we listened to this young girl’s plea. The group decided to collect money to finance Cynthia through the remainder of her junior year, to help sustain Faruk and his mother, and to provide capital for the mother to start a business. We were happy to help this family temporarily; however, Cynthia still has to finish school. We set up a committee to raise funds for this family, so please keep an eye out for future updates. Thanks to Miki Shibata for the post.